Now, it doesn't look quite that simple. Cook's first voyage, with the Endeavour, was purportedly to observe the Transit of Venus (now there's a title for a book!) across the face of the sun at Tahiti (or Otaheite, as he knew it), in June 1769. But he also had secret Admiralty orders to search for land in the south Pacific, including the Great Southern Continent, if it indeed existed. 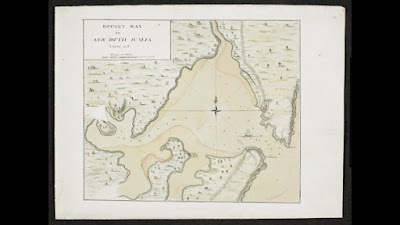 If he found land, he was 'to cultivate a Friendship and Alliance' with its inhabitants, to chart its coastline and to investigate its potential in terms of trade. Further, he was 'to take possession of Convenient Situations in the Country in the name of the King of Great Britain' - albeit with the consent of the inhabitants. On that first voyage, he took with him as a naturalist the young Joseph Banks. I've written about Banks in various History Girl posts, and he features in my recent book for children about plant hunting, Jack Fortune and the Search for the Hidden Valley - he was a fascinating and very influential character. He was also tall, handsome, genial, and one of those charismatic people who gets on very well with everybody - whereas Cook was more dour and introverted: they made a good team. So when it came to getting the 'consent of the inhabitants', Banks was a great help. Certainly in Otaheite he threw himself into socialising with the (mostly) welcoming inhabitants with great gusto. He became good friends with Tupaia, the chief priest of the island - so much so that Tupaia asked to accompany the Endeavour when it was time for the visitors to continue their voyage, and did so as a translator and interpreter. Tupaia also drew and painted scenes from their travels, some of which are displayed at the exhibition, alonside many other contemporary images, artefacts, letters and journals. Sadly, both Tupaia and his young son, Tayeto, died when, on the way back to England, after various adventures in Australia and New Zealand, the ship docked at Batavia for repairs: unfortunately Batavia was rife with fever, and almost half of the company, including the two Tahitians, succumbed. 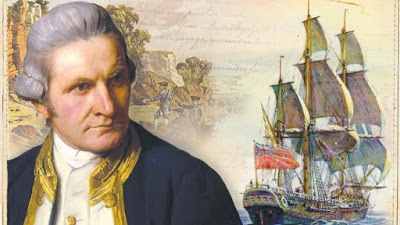 And the exhibition doesn't shy away from revealing that, although Cook was indeed a great explorer who achieved an enormous amount for his country, there was another side to what he did. The lives of the people he 'discovered' were not just touched by his arrival on their shores: they were to be changed forever, even when the intentions of the explorers were good. Tupaia and his son were one example. Another concerns a later voyage, when Cook, meaning to be helpful, presented the Maoris in New Zealand with domesticated animals - sheep, pigs etc. He thought it would make life easier for them if they didn't have to hunt for their food. But the animals had a huge effect on the indigenous flora and fauna, leading to the extinction of a number of native species. And it was Banks who suggested that Australia would be a good place for a penal colony - which on the one hand led to the creation of modern Australia, but on the other to the near-destruction of the indigenous Aborigine culture. Tupaia's drawing of Sir Joseph Banks trading with a Maori - a piece of cloth in exchange for a lobster. It's such a difficult subject; it's so easy to look at events at that time through 21st century eyes. (I dread to think what inhabitants of the earth in the 24th century might think of some of the things that are going on around the world at the moment.) But I think that the British Library exhibition succeeds brilliantly at celebrating Cook's achievements, while at the same time re-evaluating them to take into account the effect of his 'discoveries' on the lives of those he 'discovered'. The objects on display are interspersed with video interviews with modern descendants of those peoples, and they make sobering listening. Yet the message in the end was, I felt, a nuanced one: that, to paraphrase, we are where we are: but we must take account of how we got there, and not pretend that exploitation didn't take place: we must respect not only the 'discoverers', but also the 'discovered'. The exhibition helps towards that - not least by giving us an insight into the lives and cultures of the peoples of the southern and other seas at the time that Cook first encountered them. You can find out more about the exhibition on the British Library website, here. Thanks for this, Sue - important to keep reassessing these things. Have been dying to see this exhibition, Sue, and shall be down there like a shot. Thank you for this thoughtful and very interesting piece. We visited Australia a few years ago and I have been fascinated by it ever since. I’m sure you’lol find lots to interest you, Lesley - and thank you, Joan! Thanks, Sue! I didn't know about this. As massive fans of Patrick O'Brian's Aubrey-Maturin books, my husband and I will love it. I'm sure you will, Caroline! I am late to this, Sue. Thank you for posting it. I played Mrs Cook is an eight-hour Australian (ABC)/UK TV series and so I spent a fair amount of time researching the background to Elizabeth Cook and her life with her husband. She worried greatly about the risks and dangers of all his voyages and begged him to stop travelling. Each voyage meant they were apart for years, not months. Many of his crew died in the South Pacific of sexual diseases which they may have carried to the islands, or contracted there. James was more circumspect. Before his last voyage after having promised not to embark on any more such endeavours, he and his wife argued. He left before they were reconciled and, as we know, he never returned. Elizabeth outlived him and all their children and died at the age of 95. It was fascinating to immerse myself in the lives of such real-life 'heroes'. As you say, it a complex subject. His diaries reveal him to be a man who believed himself to be doing the best for his King and Country. You have brought back many memories, thank you.